Becky’s Wedding Cake | Cake, Baby! October 2010: My sister-in-law Becky let me make her wedding cake!! She also “let” me be a bridesmaid, sing in the wedding and help plan the whole thing! 😉 I spent the week before the wedding baking and making all of the gumpaste flowers. 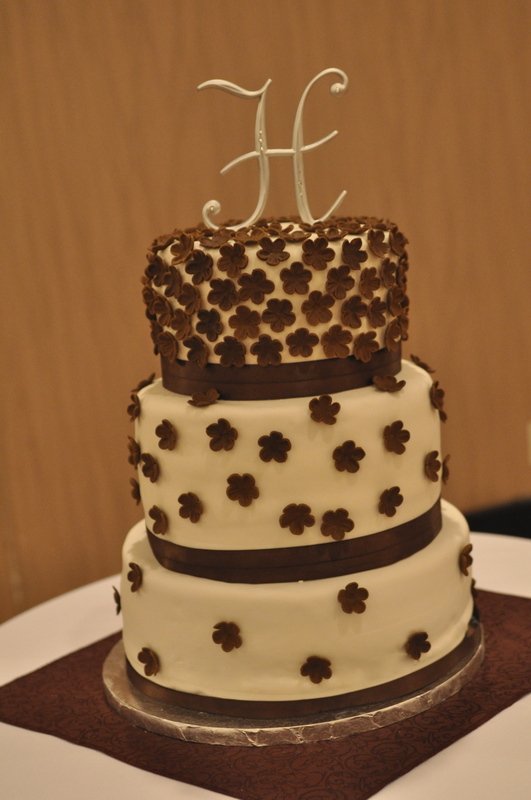 Then I layered and covered the cakes the day before and put it together the morning of the wedding. After I set it all up, I stood back and noticed the table was leaning forward. Uh oh. I folded up some extra cardboard and shoved it under the front legs and ran to get dressed for pictures. By the time I got back in to look at the cake, the bottom layer was completely collapsing due to the table leaning! (you can see it in the picture above!!) I was SO BUMMED and SO FREAKED OUT because the reception was going to start in like 15 minutes!! Let me tell you, freaking out and trying to fix a cake in a strapless, floor length gown is not the best idea! My friend Kristina was the photographer. She snapped a few pics from a flattering angle, and an extremely awesome waiter helped us lift up the top two tiers and pull out the bottom. He said “No one will even know it was supposed to be there!” Well, except Becky, but she was such a happy bride after the ceremony, she didn’t even care! They were able to still serve the bottom tier and all was well. Phew!